Government has lost any moral right to disarm civilians. We are all by now aware of the massive riots that have been burning London and other English cities for the past several days. The phenomenon of a rioting underclass and a pusillanimous police unwilling to hit thugs with anything harder than pillows is hardly new. France seems to have become used to the torching of several hundred cars per month, more when it's hot. Moscow has the same problem. Whenever there's a major sports victory or defeat almost anywhere in the world save Asia, a destructive riot ensues. America is now seeing marauding armies intending racial violence unprompted by even a tenuous triggering event. The argument over the causes is the same as we've heard for the past half-century - poverty, bad education, and racism, the hardy perennial liberal lies. The solutions proffered are the same failed ones: more money, more social programs, more preferences for the incompetent, more tolerance of the intolerable. Forget all that. What went up in smoke in London was not a store here, a warehouse there, or a car round the corner, but something far more important: the Western social contract that's held for centuries but is now in its death throes. We've all learned from Hollywood that life in the Middle Ages was nasty, brutish, and short. At any time, an invading army might arrive to burn down your village and murder your family. In between invasions, highwaymen and bandits roamed the land. The wise commoner stayed near home, in the partial safety of neighbors who knew and trusted each other. Those who had to travel did so only with armed protection, preferably their own. Over time, as government grew and became more organized, the king desired to exert a monopoly on violence - that is, to allow only his officers to beat people up, and only at his command. This has grown into the modern desire for control of guns and other weapons - after all, you don't need a gun when you can summon armed cops to your defense, now, do you? Like any contract, the social contract of violence had two sides. Western civilians have mostly given up their armaments and their readiness to use them, but in exchange for the government's promise of protection. All but the most extreme libertarians don't think private individuals need to own fully-armed tanks and missile launchers for self-defense. Why? Because we all trust the Army to defend us from anyone else who is so equipped. What if it wasn't? What if the Army wasn't able to protect us from an invading army? Then wouldn't you feel better having your own tank, or your town had a handful of them under the authority of the Mayor, dedicated purely to protecting your hometown? For well over a century, England and the United States have become accustomed to the contract being upheld on both sides. The Wild West permitted individuals to have and to use weapons of any sort because organized law and order had not arrived to defend the innocent; as the cavalry, marshals and sheriffs extended the writ of law, it was thought that the need for every man to be armed at all times diminished. Unfortunately, crimes against women have increased since women gave up their right of self-defense. England even reached the point where the police didn't need weapons, so great was their moral force and the confidence in swift retribution against any criminal. Alas, for several decades now that retribution has not been there. Criminals walk off scot-free while the law-abiding are berated for defending themselves or "not understanding their culture." Is it any wonder that the police are no longer obeyed? The police, bludgeoned by criticism for the way they handled the Brixton riots 30 years ago and the Stephen Lawrence murder in 1994, have become more like social workers than upholders of law and order. For days on end the London police don't seem to have even tried to protect the innocent. Urgent phone calls for help went unanswered until daylight, if then. For the first two days, the innocent were entirely at the mercy of the criminals, subject to whatever depravities they chose to inflict. Even now, the British government is reluctant to authorize any sort of an armed response, in a situation where any sane person knows "shoot to kill" is the only effective way to stop a looting mob in its tracks. Aluminum bats, police nightsticks and other weapons dominated the "movers and shakers" list of hot-selling items in Amazon.uk's Sports shop on Tuesday as riots spread across Britain for the third day... One of the top items, an aluminum baseball bat, gained a whopping 6,541% on its "sales rank" over the past 24 hours. 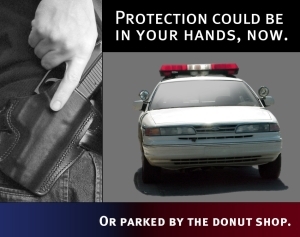 If there was no expectation of police protection, wouldn't you arm yourself to the best of your ability? A bat may not stop a bullet or a mob, but it's better than nothing. Of course, anyone doing combat can expect casualties: three neighbors defending their community were murdered while “doing the job of the police” - reportedly by a carload of looters that drove up on the sidewalk to run them down. Much more of this, and citizens will demand the right to properly equip themselves with firearms and military-style defenses - and not before time! Could this happen in the United States? It already has happened in those places where the citizenry has been disarmed, like Chicago and the Milwaukee State Fair. Where you have a highly effective, honest, diligent and disciplined police dedicated to stopping lawbreakers in their tracks, liberals have a point: individuals don't really need to be armed. The problem is that a half-century of liberalism has ensured that we don't have such a police force. Having failed to provide thoroughgoing police protection, Western governments have no right to stop honest men from defending themselves and their families by whatever means is required. The social contract has been broken; citizens now bear the responsibility of their own defense. It's time our laws recognized this, and insofar as they don't, the laws of England as of Chicago are unjust, immoral, and tyrannical. This is spot on, and you stole me thunder. I was just saying in a different article that American men now MUST start carrying guns. It is no longer an option. We need to all begin to buy and carry weapons in plain site so that it becomes common place. This is perfectly legal and while those around you may feel a bit uncomfortable, you have the right. Just make sure you read and follow the laws in your area. I recommend getting the Utah 30 concealed-carry permit. The "30" means that over 30 states accept it. If I am attached by rioters where I live or work (a large metropolitan area) I will attack back. A contract once broken, is no longer a contract and is unenforceable. However, there was never a contract, nor even a temporary verbal agreement. What is called by the Main Stream Media and others who want to seem knowledgeable and use the "modern" terms now in use, a contract, was only a veneer. A very thin social veneer. And the veneer has worn out. Governments of the industrialized nations have taken from one to give to another since our involvement in World War I. It hasn't worked. We have now been dumbed down by the educational system inspired by a group of people who swear there ain't no heaven and pray there ain't no hell. The sociopaths that call themselves psychiatrists and psychologists took over the educational system of the United States at the behest of one John D. Rockefeller. That was in the early part of the 20th century and is well reported on in the book "The Leipzeig Connection" by Paolo Lionni. Cities now have tanks and machine guns under the control of the Sheriffs or Police Chiefs. They are used to batter the citizens, not protect them. The race riots of the '60's will pale in comparison to what is coming. Curfews in Philadelphia? The citizens there don't obey the laws already on the books. Does the Mayor of that city think that a curfew will make any difference to the unprovoked hooligans who are committing the atrocities in that city? It is ridiculous, to say the least. But he has taken action! He has forbade the teenagers there to gather to commit illegal acts. It has been reported that the parents of those teenagers are going to be held responsible. What?! Parents are going to have to be responsible? Are you kidding me? Parents have been indoctrinated for several generations now that the government will take and hold all responsibility for everything. Go back to the game, or your neighbor's wife - if they are actually married - whichever comes first. There was no contract. There never will be a social contract that will quell the untrained animals that destroy without reason simply because of the color of a person's skin. With the greatest possible respect to Petrarch, I'm wondering just when the hell any government on earth ever had the moral right to disarm citizens. Governments have claimed over time the legal right or the duty to do so, but no such moral right exists anywhere that I'm aware of. My first responsibility is to myself and my family; likewise, any legitimate government's first responsibility is to the safety defense of its citizens, and the words "legitimate" and "citizens" are being used advisedly. British subjects - again, a deliberate choice - now "bear the responsibility of their own defense", to quote the last paragraph, and they're having such a hard time of it because they so easily surrendered that responsibility - and the rights on the other side of that coin - long ago. The destruction seen in Britain today is, chiefly, a combination of two factors: the rise of the socialist state which relieved citizens of the responsibility to not only protect but provide for themselves; and the importation of far too much third-world illiteracy, poverty, and barbarism. The money used to buy off these two huge, parasitically growing constituencies has now run out, and the uncivilized impulses are all that are left. Petrarch wrote a mini-history of the breakdown of the social order in western society. Now the greater question is can it be turned around? History tells us no as evidenced by the corpses of democratic governments strewn across the face of the earth. We are in death throes of a republic but it can be done. The democracies lasted about 200 years due to the citizens realizing that they could vote themselves loot from the treasury. We are currently in the complacency to apathy stage. The Tea Party is the conscience of the nation in regard to what our country was founded upon. They of course are disparaged by the liberal left as psychotic, racist, terrorists, etc., etc., etc. So far the left is failing to make any of these charges stick but like Joseph Goebbels of the Third Reich they believe that if you tell a lie often enough people will believe it in time. It is my opinion that if the Tea Party is unsuccessful in ousting the liberals from congress and the WHite House we will slide into the oblivion of just another failed democracy. Robert said something that should be repeated. The "social contract" you speak of is a meme at best. No one every told me I was agreeing to any such "contract". I do not now, or have I ever, agree to disarm in exchange for the police protecting me. The police are there to find and capture criminals so that courts can bring about justice. I do not expect police to protect me. Can it be turned around? Of course it can. Civilization does not extend to the Year Dot - there was once a time of absolute Hobbesian barbarism out of which civilization emerged. If it is possible to create a humane, orderly and law-abiding society when no prior example existed, surely it is far easier to restore one even after it has broken down. The vast majority of Englishmen, to this day, want law and order. They're currently too wimpy to stand up against what is still a small minority of barbarians, but that can easily change if only they will themselves to do it. Same goes here in the U.S.
For this reason, I view the London riots and recent American race-mob incidents as a good sign, just as Obama's presidency may be a good thing too - simply by virtue of waking up the slumbering majority and rousing them to urgently needed action. 1) In 2008 I stated that obama winning would be the best thing for the conservative movement as McCain would have compromised us into oblivion. 2) We will not overthrow the heavy yolk of government until the 60% in the middle start to get involved in what is going on in Washington. They do not realize that for every dollar they send to DC they only get back $.75 along with more regulations in order to receive the money that they sent there in the first place. This is at the core of the problem, people do not realize that government does not produce any thing. Human nature being what it is they want something for nothing. 3) The Miranda ruling exacerbated the lawlessness we see today. Police can't use common sense, they have to be a lawyer. Swift justice should be meted out, no more of these delay tactics by lawyers. We have to quit trying to figure out what is "is". Petrarch's analysis is spot on as far as it goes, but there's huge elephant in the living room: the UK's post-war immigration policy. After World War II the Brits for some bizarre reason decided to throw open the immigration gates to non-Europids. Not having learned from the US experience, the UK allowed in a tidal wave of Afro-Caribbeans. Like a modern-day Cassandra, Powell was castigated by the usual suspects. Newt Gingrich, a has been that has become a wannabe, started using the term "contract with America" about 20 years ago or so. There is an outfit that goes by the moniker, "The American Contract" or some such thing. A contract is an agreement between two entities, or among three or more entities to do or not do something. There must be consideration. Each party must receive something of value, or that is considered of value to the parties involved. A parent can sell property to a child for one dollar and love and other consideration. It is binding. The IRS plays hell with such a contract, but it is good. I did not agree to accept the offer made by Gingrich. Most Americans did not accept the offer. But the main stream media kept using the term. It has come to be accepted that we have a contract with some entity or other when nothing of the sort is true. I have tacitly agreed to leave my neighbor alone with his/her property so long as I am left alone with mine. If there is a contract to which I have agreed that the government will take care of me, please, would the holder of such present it? All of the agreements must be written out. Nothing can be assumed. If you ask your bank manager for all of the 'contracts' to which you have agreed when you opened an account, there would be a truckload. Ask your bank manager. They are hidden contracts of which you have never been informed, and, therefore unenforceable. I know not of any "Social Contract" to which I have agreed. Certainly, I retain all of my natural rights as granted to me by my Creator. I agree to refrain from using all of the power of those rights in order to have some semblance of order in society, however. Throughout history governments have pushed the average man to the brink of a precipice, and expected no fight. Baseball bats, stones, sticks and sharp instruments may not be much against a tank, but the numbers wielding such weapons will ultimately overwhelm the tanks.